I have the honor of having been rejected by Every Day Fiction. One learns to take rejections in stride--to reflect, to learn, and to move on. One editor did mention the following: "There is lots of talent here and I would like to see more work by this author." Nonetheless, the letter ended with the ubiquitous "We wish you good luck in placing the story elsewhere." There is a point to my comments on the story's rejection (other than whining): it was accompanied with personal comments from two editors. I've learned to enjoy and appreciate any feedback that extends beyond a form rejection letter. Thank you, Every Day Fiction magazine. 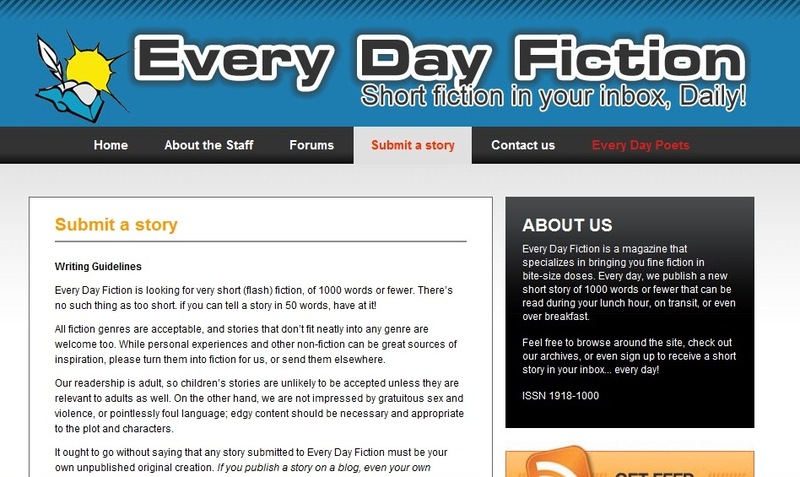 Every Day Fiction publishes each day a story of no more than 1,000 words. "There’s no such thing as too short. if you can tell a story in 50 words, have at it!" It ought to go without saying that any story submitted to Every Day Fiction must be your own unpublished original creation. If you publish a story on a blog, even your own personal blog, it is considered published and therefore inappropriate for our market. Every Day Fiction pays three dollars per story--a mostly symbolic yet appreciated gesture of respect. One may donate the remuneration back to EDF. The zine also provides links to your blog, webpage, or your Amazon book page. I have published two poems through EDF's sister zine, Every Day Poets. The staffs of both publications have been friendly, respectful, and industrious (a poem/story a day!). The magazines have published "best of" anthologies and EDF also maintains a blog, Flash Fiction Chronicles. The zine's staff is international, although the publication appears to be based in Canada. The webpage embodies an orderly, conservative appearance, and that's fine by me. I prefer the "flash" to be in the fiction. 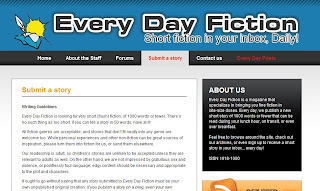 Thanks for taking time to write about Every Day Fiction. It's not often you get such a glowing review after handing out a rejection. I think it is important to communicate with writers and am glad we've been able to offer the sort of feedback you found helpful. It's worth noting that just because a piece isn't a "fit" in one place, that it might not be accepted in another. Short of poor prose issues or threadbare plot devices, success is often just a matter of finding the right home for your story.